In the absence of appropriate measures, the workers said they are facing different health complications. Some of the common symptoms include red eyes, chest irritation, and hand and foot blisters, a worker said anonymously. Pesticides are mainly used to protect the plants from fungal and bacterial diseases, kill grass around the plants that attract grazing cows, and ward off spiders that feast on leaf buds. Md Nurul Mohmaimin Milton, general secretary of the environmental journalists' forum in Moulvibazar, said workers in 156 tea gardens are exposed to dangerous chemicals. The indiscriminate use of pesticide has gone up in tea agriculture, raising concerns for the more than 130,000 permanent workers in the industry, he told The Daily Star. None of the gardens ensure the controlled use of pesticides or safety equipment, he alleged. 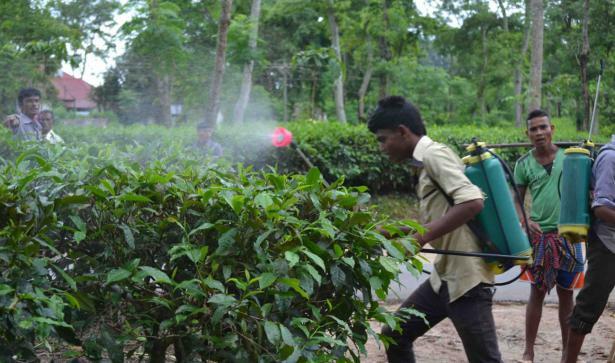 Makhon Lal Karmokar, president of the Bangladesh tea labour union, said a worker gets Tk 82-85 to spray an acre of land, which is expected to take six to seven hours. Spraying pesticides on the same amount of land on hilly terrain takes much longer, but workers are not given overtime for the hazardous job, he added. Dr Satyakam Chakraborty, civil surgeon of Moulvibazar, said protective clothing when handling or applying pesticides can help minimise pesticide exposure and reduce the risk of poisoning. Pesticides are valuable pest management tools and must be used carefully and responsibly, he added. Md Yusuf Ali, deputy inspector of the Department of Inspection for Factories and Establishments, said tea gardens must provide masks so that workers do not inhale toxic fumes while spraying pesticides. However, he did not receive any such complaint, he said. Narayon Saha, former head of Department of Forestry and Environmental Science at Shahjalal University of Science and Technology, said the excessive use of pesticides affect land fertility and seeps into the rivers or wetlands with rainwater. This correspondent tried to contact several tea garden managers, but most of them refused to comment on the matter.